kingstree high school fights last September…and are still at it even today! I wondered if this school was ever in the news and lo and behold, it often is due to fights there. Kingstree is virtually all black students and after 60 years of ‘school integration’ there is less integration than any time in our history and the reason is simple, the same reason I had to remove both of my own children from schools: black children are very violent due to the collapse in school discipline and being raised by mainly just mothers and more likely, grandmothers with near-zero male influence. This violent black southern school, Kingstree, is in the news yet again today due to staff being forced to stop girls from viciously pummeling each other when they are supposed to be going to school, not WWIII. Three months earlier, when 9-year-old Jamyla Bolden was cut down by a stray bullet as she did homework in her Ferguson, Mo., apartment, the response was different. There were no protests or demands that city officials step down. The night after her death, demonstrators in nearby St. Louis took to the streets, setting fire to a vacant house and a car — not in response to Jamyla’s death, but to protest the police shooting of a young black man in the back during a drug raid. Thugs love to point out that cops shoot them. But what about the victims of thugs? Here is one from New York City. A very young child. 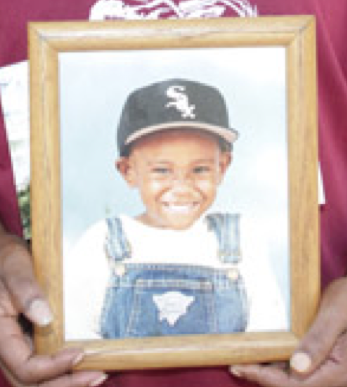 Unlike the thug pictures used to promote the idea that they were sweet young men when shot by cops, using photos years ago instead of their mug shots, this is a real child who really was totally innocent killed by a black thug who believes that black lives do not matter at all. And this philosophy of the Street has taken off like a rocket with black thugs shooting up all those cities where cops were told to stand down. What a surprise this is not. I know very well after fighting crime in black neighborhoods in the past, stopping thugs is a violent, ugly business and I was not delicate or nice about it, either nor were anyone working with me. We were tough, hard and persistent and we used muscle. Liberals believe that being nice makes thugs nice. Nope. Never. White and black crime are quite different. There is literally more white white collar crime than black white collar crime. But street crimes are overwhelmingly black crime. Mass murders are mainly white males but individual murders are nearly all blacks and increasingly, Hispanic shoot outs due to the illegal drug trade and the collapse of the family structure. The sad thing here is, we are not allowed to discuss in public what is going on even as black and Hispanic crime causes great misery in both communities while schools fail in these same places and everyone loves to blame white Europeans for this mess while ignoring the actual causes. If anyone dares mention the real mess, they are crucified by liberal media.